Hudson Wight is marketing an offshore spec ‘Keelboat Sailor’s Kitbag’ with all your key requirements for under £400. Hudson Wight might be the new kid on the block amongst the myriad of clothing brands in the UK marine leisure market but the team behind the launch of this latest apparel brand, described as ‘performance sailwear for everyone’, are in it for the long haul. Hudson Wight combines sailing experience, proven fabric technology and design and manufacturing expertise to produce great looking, lightweight and breathable ‘offshore spec’ gear at less than half the price of other brands by supplying direct to the customer. The brand, targeted at sailors racing and cruising inshore and offshore and launched directly to its target audience at AAM Cowes Week in August, is kicking off its Autumn season as the Official Clothing Sponsor to the Garmin Hamble Winter Series, commencing Sunday 6th October and running over eight weekends until 1st December. Hudson Wight’s Marketing Director, Jeremy Pocock, explains that initially they were lined up as a Day Sponsor of the Series, but when the opportunity arose to be the Official Clothing Sponsor they were delighted to grab the opportunity. As with all clothing for use in extreme environments, Hudson Wight had to come to the market with fully tried and tested fabric technology, in the form of OceanVent, the very latest generation of 2 and 3-layer breathable fabrics designed specifically for sailing. Hudson Wight comes to market with the fully tried & tested fabric, OceanVent. Hudson Wight advises all sailors to choose 3-layer laminated fabrics with a hydrophilic PU membrane and no separate mesh lining for their foul weather sailing kit. Whilst much more expensive to produce, it is lighter, dries more quickly, expels moisture more efficiently, is easier to put on and take off and is more comfortable to wear than 2-layer products with separate mesh linings. LAYER 1 – Lightweight, flexible and highly durable nylon face fabric treated with an extremely Durable Water Repellant (DWR). LAYER 2 – Highly waterproof and breathable Hydrophilic PU membrane, laboratory tested to withstand over 20,000mm of vertical water pressure and to allow moisture to escape at a rate in excess of 10,000 grams / sqm / 24hrs. This exciting development of high performance membrane, laminated to the back of the face fabric, actively absorbs humidity and sweat produced by the body on the inside of your garments and allows it to evaporate rapidly on the outside. LAYER 3 – A non-absorbent mesh lining, laminated to the inside of the hydrophilic PU membrane to protect it from wear. The Hudson Wight 2013 range comprises a Sailing Jacket and Salopettes, a Day Jacket, Gilet, Sailing Bag, Cap, Gloves and Wallet in various colour options. 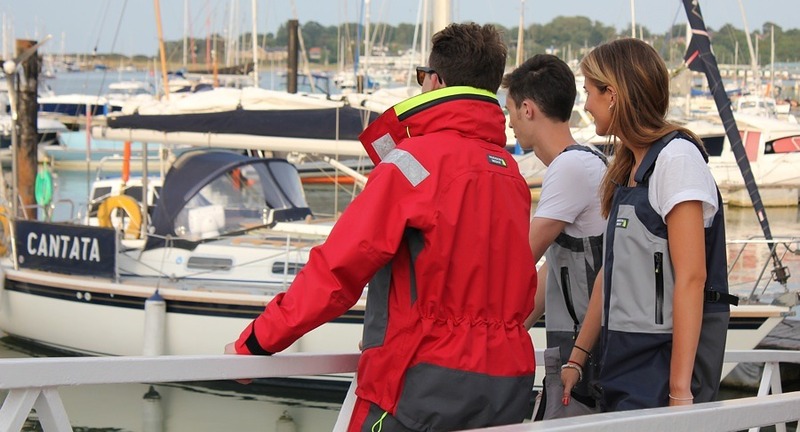 All product details and information about the Hudson Wight Sailing Club Affinity Scheme can be found on the Hudson Wight website http://hudsonwight.com/ or telephone: 01983 300 144 for more information.